Eating out is convenient and relaxing. Unfortunately, it is also expensive and often wasteful. However, a family restaurant in Villaseca town of Valle del Elqui, Chile may inspire the way restaurant cook their food in the future, via solar ovens. At the Villaseca Solar Restaurant all the food is cooked in locally and handmade solar ovens. 10 solar ovens cook enough eco-friendly and healthy meals to serves up to 70 people a day. It can take several hours for a meal to cook, but that doesn't discourage customers from eating at the restaurant. What happens when the sun don't shine? Well in Chile, the sun shines for about 310 days according to Wikia. 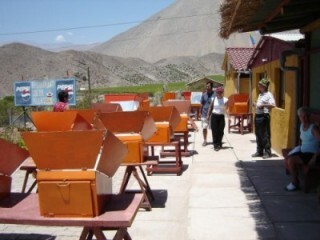 10 solar ovens are used to serve up to 60 customers a day. "On weekends, about 60 customers a day come to savor its specialties: fresh bread; cazuela, a meat stew; and leche asada, or flan, for dessert. It takes two hours to bake bread and about three hours to cook stew" (http://solarcooking.wikia.com). The idea for a solar oven restaurant started in 1989 when four women in a village of 300 people agreed to allow researchers from the University of Chile to place solar ovens in their home. When the research end and the solar ovens needed to be returned the women didn't want to let them go. Together with the help of others they raised enough money to make their very own solar ovens. They built 33 solar ovens. After a couple of years of experimenting with these ovens, to make them easier to handle and more efficient, the Villaseca Solar Restaurant was born. Watch this detailed YouTube video of a ride up the restaurant for a tasty meal. Doesn't the food look delicious? Gift idea! Anyone want a solar oven for a gift during the holidays? Count me in. 3 Spring Toys That Will Drive Your Cat Wild! & having solar cooked meals wow some Rage & great for Disaster planning alone IE Off the Grid.